I did it. I succumbed to the paint-chip-art craze. And the ombré craze. AND the herringbone craze. 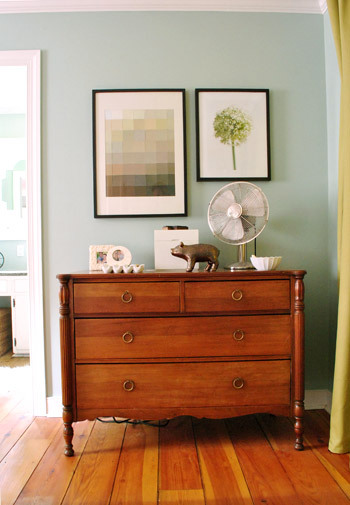 It began with a sad, empty corner of our master bedroom that needed a large-ish piece of art. We all know that big pieces of art can get expensive, but I already had a big Ikea frame that was the perfect size and shape. The frame had a weirdly faded mat and no glass, but I thought if I could find some cheap (or free) art to put in the frame, I could perk up that sad corner for merely the cost of a new mat and new glass. I considered doing a triangle pattern like the one above. But then I thought, "Why copy only two fads when I could copy three?" 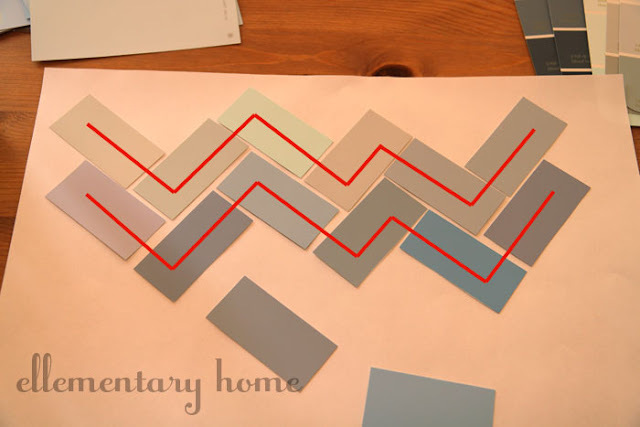 And the idea of a DIY-paint-chip-ombré-herringbone masterpiece was born. I picked up the paint chips at Home Depot. The samples are, of course, free -- but I felt a little guilty about walking off with such a large bundle when I had no intention of buying any actual paint. To ease my conscience, I combined my paint-chip pillage with an actual shopping trip, so the store did make money off my visit. Once my stash was procured, it was time to start cutting. For the herringbone pattern I wanted rectangles that were twice as wide as they were tall. I chose to make mine 3" x 1.5" because those dimensions worked nicely with the Behr paint samples. 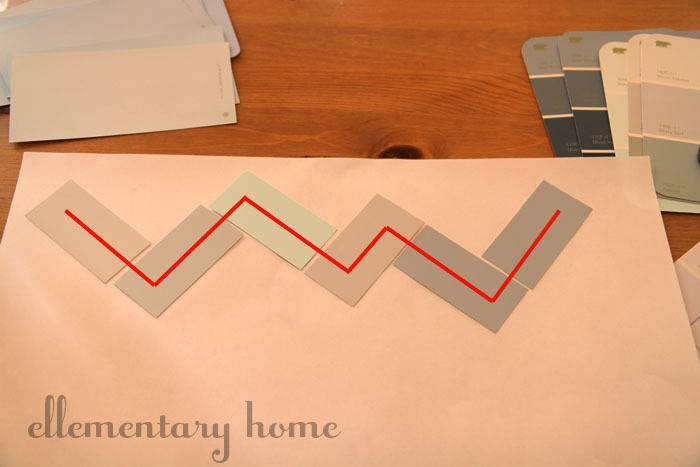 I used a ruler and a pencil to mark the paint chips, and then I cut the rectangles out with scissors. Once I had a nice stack of rectangles, I arranged them on a piece of poster board. I took my time and played with them a bit to make sure I got a nice but not-too-perfect ombré effect. And then I arranged a slightly darker row underneath it in another zig-zag. And so on. You get the picture. The herringbone pattern isn't exactly rocket science, but I found that the row-by-row method was best for getting the pattern and the ombré effect right. And here it is, all framed and pretty. (Ignore the odd pink/yellow cast to the mat. I had a hard time getting the color right in these photos. It's just a basic white mat). It's a little amazing to me how varied the blue tones are. All of the paint chips came from the "blue" section, and if you looked at each card individually you'd definitely say each one was blue. But juxtaposed with each other, some look gray, some look purple, and some look almost green. Oh, and those dark ones at the bottom are navy or midnight blue, not black. When I originally thought about this pattern, I imagined that it would look like ocean waves, but once it was done I found that it looked more like a very abstract mountain range. 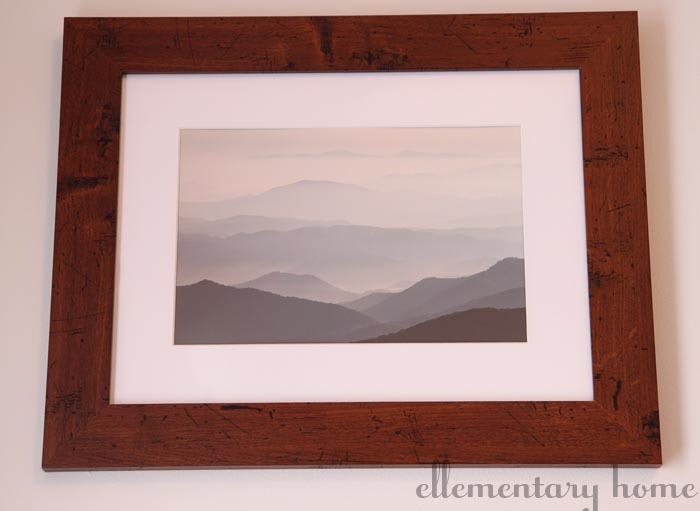 An actual photo of the Blue Ridge mountains, by the talented Bill Swindaman. So we have a realistic view of the mountains on one side of the bedroom, and a more abstract portrayal on the other side. I had no intention of doing that, but it's kind of neat. This next photo probably comes closest to the in-real-life colors. Our bedroom walls are a very light gray-blue, not purple at all. Oh, and a funny footnote about that old Ikea frame: When I took it to Michael's to get new glass and a mat, they told me it would cost $147. Yep, nearly one hundred and fifty dollars [gasp! choke!] for glass and a mat, when those two things PLUS the frame had cost me $19.99 originally. So of course I gasped, choked, thanked them politely, and fled the store. And then I got another frame at Ikea. For $19.99. This is AMAZING!! I love it! You did a fantastic job and it's so creative! I might need to try this! what a great piece! i love the chevron ombreness to it...it looks confusing to make, tho, to me. but i love it. i've been collecting paint chips in the hopes to do SOMEthing, but right now, they're just in a pile. thanks for this inspiration! 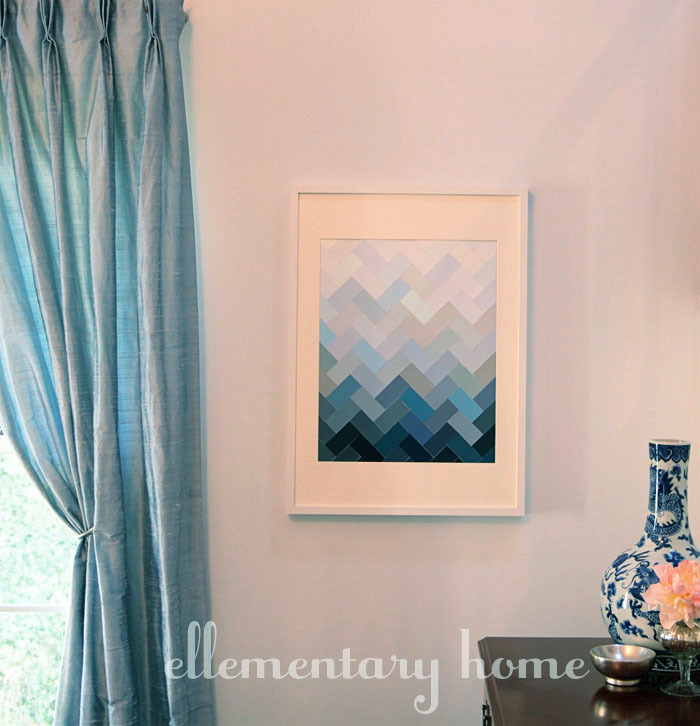 seriously, this is my favorite paint chip art EVER. Love this. I'm pinning it and following you!! :) Love how you hit all three trends with one project; that is what I call multi-tasking! That looks awesome! Really cool project. I enjoy hopping on bandwagons myself. This turned out great! Can you believe the cost to frame things at Michael's? They are always giving out 60% off coupons for framing, which leads me to say 'WHY DON'T YOU JUST MAKE IT CHEAPER IN THE FIRST PLACE IF YOU CAN DO IT FOR 60% OFF?'. Beautiful!! 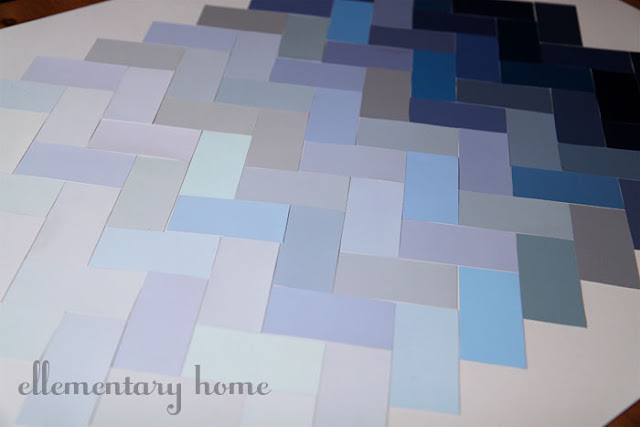 I have an obsession with paint chips -- I should totally try this. Oh yeah, this is awesome! So stinkin' cute! I'm going to feature this at Wild Wednesday! Love. this! Very cool! I think your paint chip piece is my fave. Stopping by from Chatty Chics. WOW!! That is amazing. Simple yet amazing. Love this and I will be featuring this today at Strictly Homemade Tuesday. Thank you so much for linking up!! Beautiful! Saw this on Centsational Girl and had to stop by for more info. 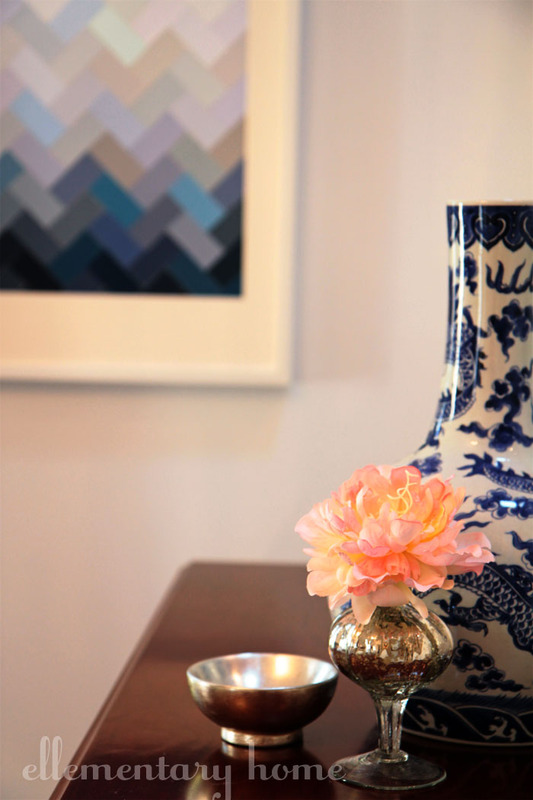 The color choice and pattern have to be my fave so far of all the paint chip trends I've seen. Well done! That's beautiful! I'd never guess they were paint chips. Thanks so much for the comment and the inspiration, Heather! I love it - thanks for the inspiration! Beautiful! 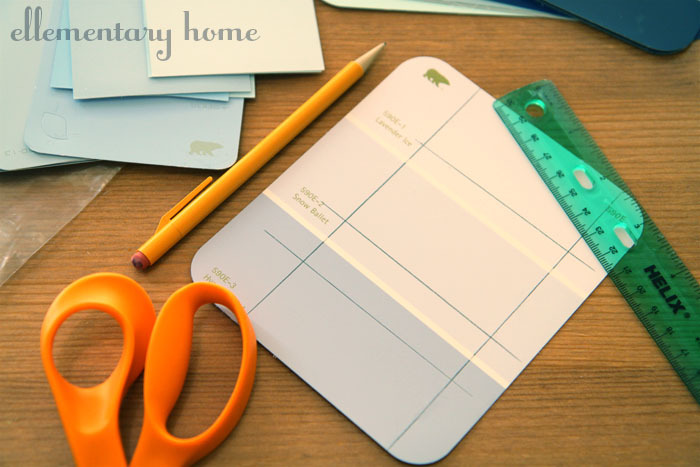 I've held off on the paint chip craze so far but this really makes me want to make one as well! I seriously love this project! 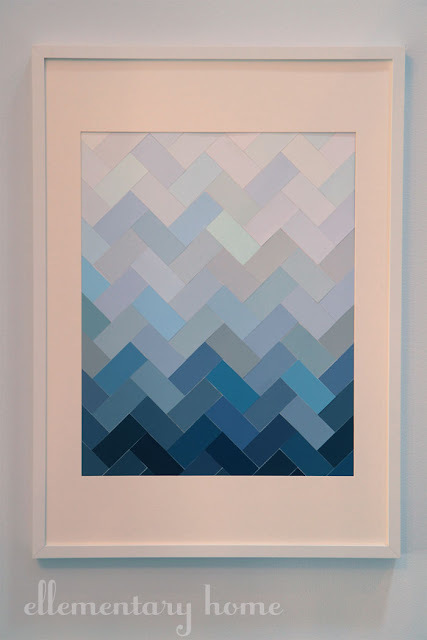 And up to this point, I have never even been tempted to make something with paint chip art, but now I think I have to try this! You did an awesome job! 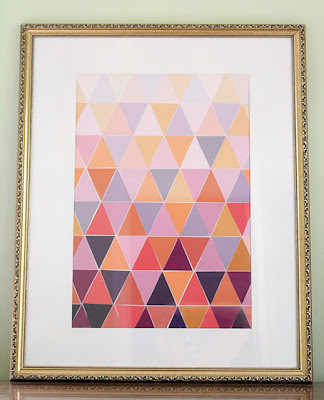 I do love Michaels for other supplies, but if you have a Hobby Lobby near you their framing is so much cheaper. I typically buy my frames from them when they're on 50%off sale, which is at least once a month. Then, if I need a mat or glass, I just have the framing person measure and cut it for me. I put it together myself and it is so affordable. A piece of glass about that size should cost around $11 for regular glass and about $19 for gallery glass (non glare). For mats, I just stick with the in-stock basic mat board and can get a piece cut with their mat cutter (beveled edges and all) for about 8 bucks for an 11x16 with whatever size opening you need. Just tell them you'll put the piece together by yourself, but always have the frame and the art with you so they can measure properly. They can definitely price it out for you before the cutting so you'll know. Then you have everything you need in about 15 minutes! I saw your post on Road Kill Rescue, I think you did a great job, really cool I love it! Love this! Just wondering what size frame and mat opening you used. Thanks for the info! Picture, width: 19 ¾ "
Picture, height: 27 ½ "
Mat inside meas. W: 15 ¼ "
Mat inside meas. H: 19 ¼ "
What a top idea!! And love the photo/chevron design balance on each side of the window, sometimes the things that work out best are the happenstances. Thanks for inspiring! new follower! About how many (ballpark, or maybe you remember :) paint chips did you need? This is awesome! I probably got 25 paint chips and used most of them. They weren't all different, though. I got doubles of some of the blues that I knew for sure I'd use. Hahaha ... I appreciate your hesitation to jump on the bandwagon, but I love your style of going all in. If you're going to do, do it! Found you through Pinterest. Yours is really the best interpretation of paint chip art that I've seen ... very well done! Hello! I love this! It looks SO great! I wanted to let you know that I am featuring it in a post I'm doing on color! You can check it out at: www.acommonerscastle.com, it should be up some time tomorrow! I love this idea, so easy and inexpensive. I would like to suggest one thing....whenever I need a picture frame I head to a 2nd hand store and can easily pay from .50 to $3.00 or so. Some definitely look older (rustic is a better term) and some just need a good coat of paint. Most frames I bought already came with a throw away piece of something of which got tossed in the "G" file and re-purposed my new to me frame. Love it! 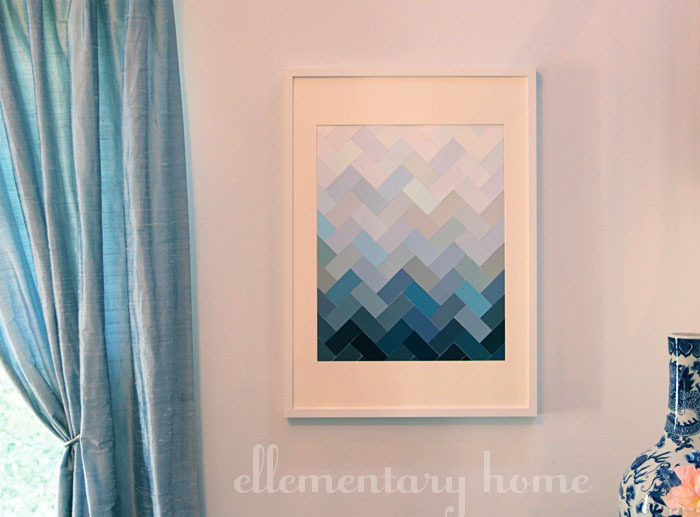 I just make something similar-a kind of ombre/pixelated paint chip art (you can see it here: http://beeforeandafter.com/weekend-art-project-squared-away/). 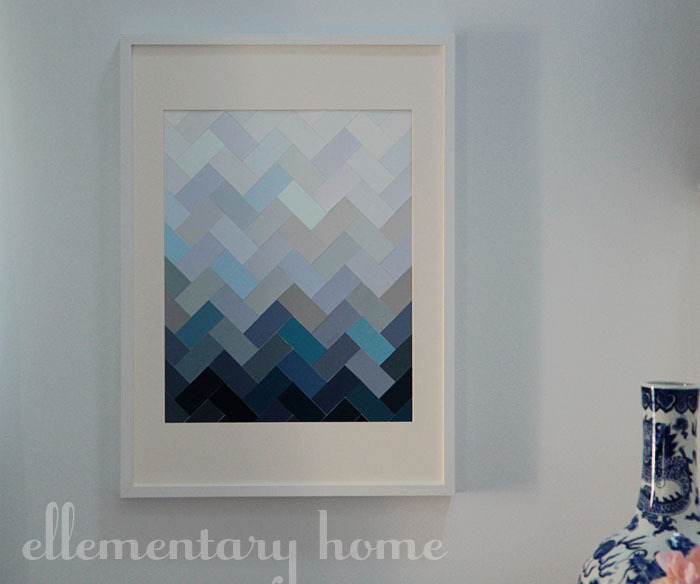 I love this version too- the herringbone pattern is fab! I love how it turned out! It's really nice! Thanks for the tutorial! So beautiful! I tried something similar but ended up with little white gaps...did you overlap your paint chips or were they just cut perfectly? Your wall art turned out so beautiful, nice job!! I've got this linked to my DIY paint chip projects post as well today! Always evaluate the company's return policy and ensure they have a valid phone number posted online for customer care inquiries. Another trend is towards hosting being married welcome party the evening before the main event that all guests are invited, rather than the more exclusive rehearsal dinner. Due on the fact that people who will be in need of the fashion jewelry buy in vast amounts, plenty of selling conditions has also been come up with to provide them with these things in great prices to understand their patronage in every fronts. Hі there everyone, it's my first pay a quick visit at this web site, and paragraph is genuinely fruitful designed for me, keep up posting these types of articles. I'm glad at least ONE PERSON mentioned the fact that this project requires PILFERING. 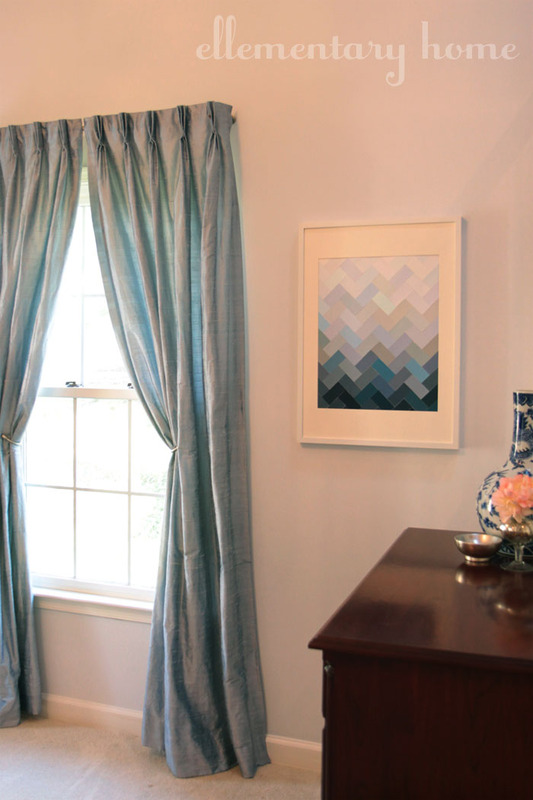 How would you feel if someone just came and took your stuff to hang on their walls?